・ During the campaign period, get Daily Missions and Connection Time Rewards to obtain 「[EV] Soulworker Goods Entry Ticket」, and participate in the Soulworker Original Goods Lottery. ※ The more tickets you have, you can participate in the lottery of more products. ・ The lottery will be drawn in this order: 「Original Clock」 → 「Original Tumbler」 → 「Original Pass Case」 and the number of entry tickets. ・ The lottery will be drawn for characters that achieved the set conditions but, winning will be on a per account basis. 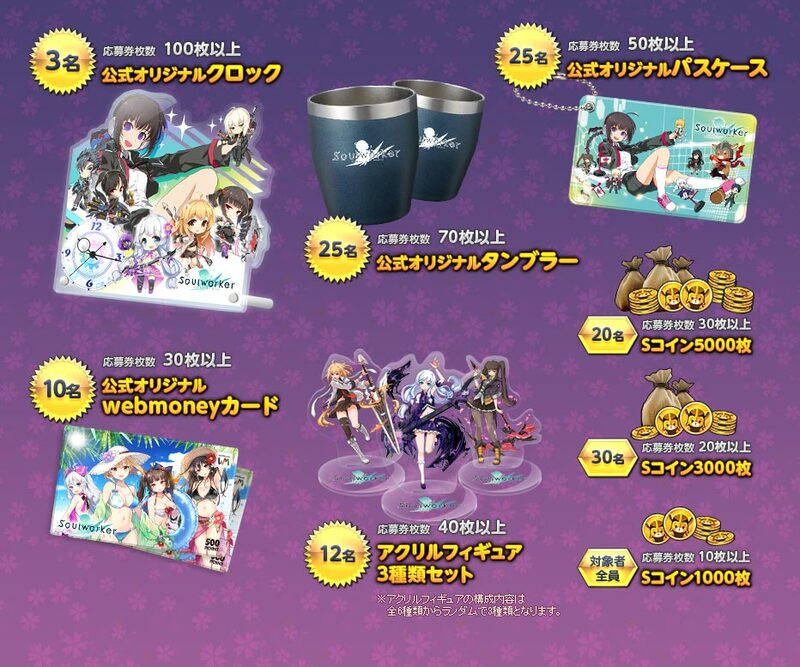 ・ Accounts that already won the lottery can no longer win the other 「Official Original Goods」. For example, if you won the 「Original Clock」, you can no longer win the 「Original Tumbler」, 「Original Pass Case」, 「Original Webmoney Card」, or another 「Original Clock」. ・ You cannot select products. ・ Only participate in the lottery if you can provide your shipping address and name. ・ We do NOT ship outside Japan. ・ For the S Coin Lottery, you can win multiple times. ・ The S Coins will be distributed to the winning character’s account mail.